We are big fans of our spelling curriculum, All About Spelling! I love the approach they take in teaching the rules and we have been having a fun time adding in some more hands-on spelling practice after several days of using tiles and/or practicing with pen and paper. 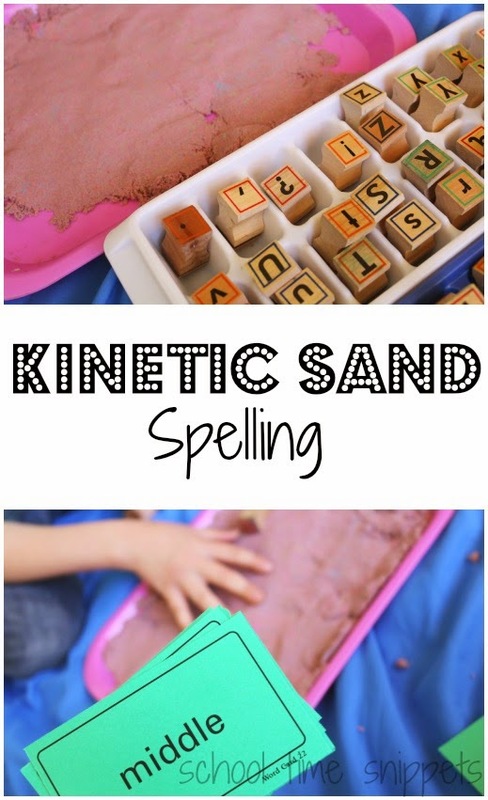 Just last week we shared our Mix, Dump, & Spell activity; today we are sharing a way to practice spelling using alphabet stamps and kinetic sand. I used PreK Pages handy tip of using an ice tray to alphabetize the stamps for easy access and simply called out a word from my son's All About Spelling flash cards for him to spell. We love to mix up how we practice Big Brother's spelling list. If you are looking for a Spelling curriculum, I highly suggest All About Spelling. Big Brother is currently on Level 3!